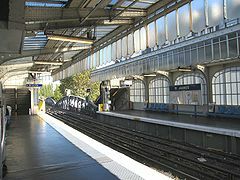 The Paris Metro or Métropolitain is a rapid transit system in the Paris Metropolitan Area. See also category: Paris Metro. Not to be confused with Réseau Express Régional. See also category: Paris Metro lines. See also category: Paris Metro Ligne 1. See also category: Paris Metro Ligne 2. See also category: Paris Metro Ligne 3. See also category: Paris Metro Ligne 3bis. See also category: Paris Metro Ligne 4. See also category: Paris Metro Ligne 5. See also category: Paris Metro Ligne 6. See also categories: Paris Metro Ligne 7 and Paris Metro Ligne 7bis. See also category: Paris Metro Ligne 8. See also category: Paris Metro Ligne 9. See also category: Paris Metro Ligne 10. See also category: Paris Metro Ligne 11. See also category: Paris Metro Ligne 12. See also category: Paris Metro Ligne 13. See also category: Paris Metro Ligne 14. See also category: Rolling stock of the Paris Metro. See also category: Maps of the Paris Metro. See also: Réseau Express Régional and Paris. This page was last edited on 19 March 2018, at 12:09.